This week I attended three radio training courses with Ian Peacock at the BBC Scotland HQ in Glasgow. Ian could not have a more appropriate surname – the kind of radio he makes is colourful, creative, and bursts out of nowhere, demanding your attention. The three sessions focused on different areas; how to create dynamic discussions, how to use music in radio to create mood or emotion, and how to add texture. I can’t share everything we covered in the sessions here, but I thought I should some of the key points from each. Feedback, links and more ideas would be very welcome! 1.Good discussions should have a shape and a plan, but there should be space for synthesis and dynamic exchanges between the participants. All too often discussions end up with the presenter talking to one contributer, then the next, then the next. Only when the different guests start to dialogue and connect with each other can something really exciting and unexpected take place. 2.Guests, and indeed the presenter, should play a role within a drama – goody, baddy, explainer, catalyst, fan, sceptic. Cast your guests as if you are casting a play – to illuminate and entertain. 3.Avoid the usual subjects when selecting guests. Think about gender, age, and ethnicity. Pick them as much for their passion, enthusiasm and clarity as their authority. Avoid guests who sound the same – it can be confusing for everyone. 4.Take some risks. Make sure you ask a killer question. 5.Be well prepared, but not inflexible. Make sure you get the presenter to follow up on new subjects, and not just stick to a list of questions. Often, you can do this with one word prompts on talk-back at the right moment. 6.Talk back – keep it to just a couple of words. Don’t speak over the presenter, and only at the start of a guests reply – if you speak near the end, they may not be able to pick up the thread of the conversation. 7.A good discussion should produce both HEAT and LIGHT. In other words, it should both illuminate a subject, but also (if it is to hold an audience) it should have some passion and human emotion in it. 1.Choose a sound-world for your program, and let this inform your choice of songs. Don’t mix and match between different genres just because the lyrics are some how relevant to the subject of the program. 3.Voice-overs – try to let the presenter hear the music whilst they are doing a voice over, so that they can try to match the energy and rythmn of the music. 4.Experiment with different fades and beds. Try a sharp sudden fade (an edge.) Try a fade to black with a beat pause! Try keeping a very low bed under speech, almost at the subliminal level. If you have felt a song under though, ask yourself why it is still there – what purpose is it serving? 6.Say no to knee-jerk music which tries to ellicit a clumsy emotional response from your audience. They won’t thank you for it. 8.Be curious about other musical genres. N.B. Ian seems to have made it a mission to listen to all kinds of obscure musical forms, and played us recordings of Japanese gagahu folk music, German Schlagger music, Boogie-Woogie, over-tone singers, and even a music box cover of George Michael’s Careless Whisper. The point is not necesarily to like them all, but to be interested in the effect and mood that they create – it may well be that you want to make your audience feel tense, uncomfortable, or disorientated! 1.Ian got us closing our eyes and playing with different objects in the class – playdo, bubble wrap, feathers, and even a moist slice of tomatoe! He says that you can make a program with these textures – wet, slimy, gloopy, sticky, poppy, scratchy… don’t be afraid to use adjectives to describe you you want your show to sound. 2.Think visually – this will give you a clue as to what sounds you might use. He often thinks of films with a certain look and feel, and that then leads on to a sound treatment. 3.Try multi-miccing a single recording to get sounds from different persectives simultaneously. 4.Never record less than 3 mins of ambient – you don’t want to have to loop it. 5.Experiment with bin-aural sound. Check out omni-sound. 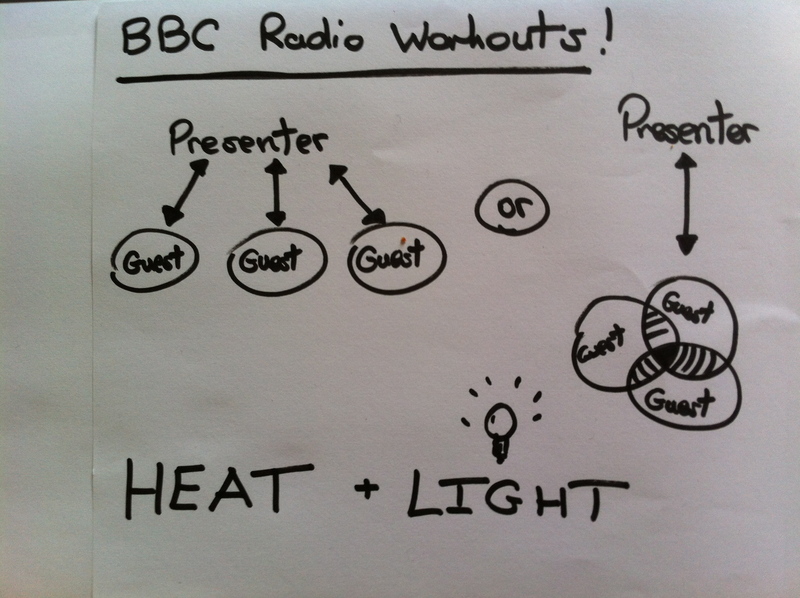 6.Silence is very powerful – the radio equivalent of darkness. 7.Try experimenting with lo-fi sounds and technology – recording onto tape or through a phone to create texture or an effect. 8.Try a live fade, where you/and or guests move away from the microphone or sound source. 9.Don’t go for an experimental sound for it’s own sake – there must be an authentic reason for it. The Third Coast Short Docs Challenge – Neighbours, bees and me.